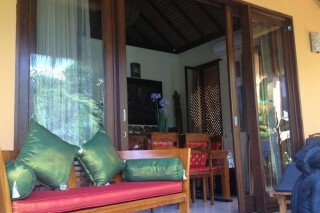 Enjoy the peaceful stay with our Villa, a new nature villa with traditional Balinese concept. Once stepping into the Villa, you will capture the coziness of the interior in wooden furniture. From our Nature villa, you can share your time to find out your favorite fashions at topmost boutique and delights of nightlife around Seminyak, Bali. 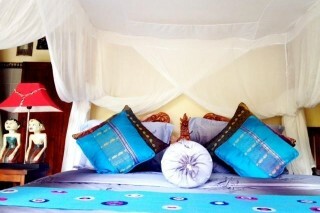 The homely villa will provide you with a flat-screen satellite TV, air conditioning and a DVD player. There is a full kitchen with a microwave, kitchenware and a refrigerator. Featuring a bath or shower, private bathroom also comes with a hairdryer and bathrobes. You can enjoy pool and garden views from the room. Breakfast is served daily in the villa. 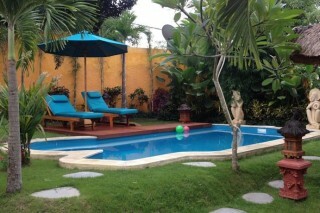 At Villa, you will find a garden and sun terrace. 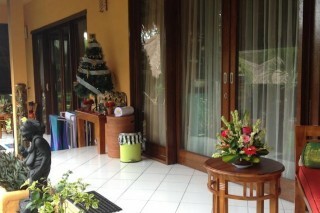 The friendly staff can help arrange for car hire, in-villa massage and free daily maid service. 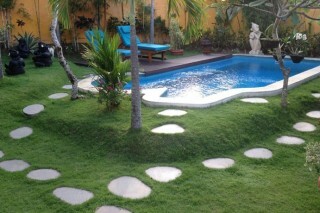 The property offers free parking.This self-catering accommodation features free WiFi throughout. Seminyak Beach, Tiara Dewata Supermarket,Batu Belig Beach,Petitenget Beach,Petitenget Temple.